By Nathan Outlaw, Restaurant Nathan Outlaw. For the curry sauce, put the garlic, ginger, turmeric, cumin, tamarind paste, chillies and curry powder into a food processor and blend to a paste. Heat a large saucepan over a medium heat and add a drizzle of oil. When hot, add the onions and sweat until well coloured and caramelised. Transfer to a plate. Clean the pan, place it back on a low heat and add a drop of oil. When hot, add the curry paste and sweat gently for four minutes. Add the caramelised onions along with the tomatoes and cook for three minutes. Next add the water and coconut milk and leave the sauce to cook on a low heat for one hour. Meanwhile, place another pan with a tight-fitting lid over a medium heat. When hot, add 20 mussels with a splash of water and replace the lid. Steam for two minutes, or until the shells have opened, and then remove them from the pan. Discard any unopened mussels. Once cooled, shell the mussels, place in a bowl, cover and refrigerate. For the batter, mix the flour and cornflour in a bowl and season with a little salt and pepper. Stir in enough soda water to give a smooth consistency. Chill until needed. Season the curry sauce to taste. If it's too thick, add a little more water. Add the cauliflower to the sauce and cook for five minutes. Add the remaining mussels in shells along with the monkfish and spinach. Cover tightly and cook for four minutes until the mussels open; discard any which remain closed. While the curry is cooking, heat the oil for deep-frying in a deep-fryer or deep, heavy pan to 180ºC. Pass the shelled mussels through the flour to coat, patting off the excess. Deep-fry them in two batches. One by one, dip them into the batter and lower into the hot oil. Deep-fry for a minute or until crispy. Remove and drain on kitchen paper and season with a little salt. Add the chopped coriander to the curry and divide between 4 warmed bowls. 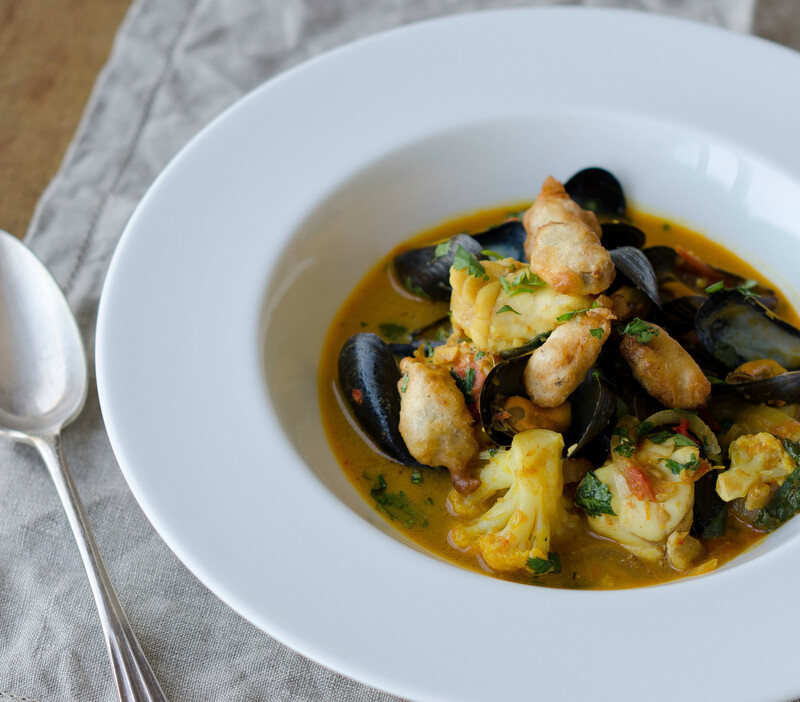 Top each serving with 5 crispy mussels and serve at once.